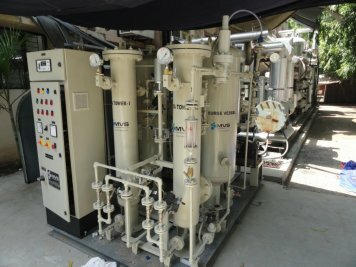 Nitrogen generation setup is a facility possessed by High Temperature Technology Division (HTTD), which extracts Nitrogen from air and supply to the required system inlet. Flow rate of the Nitrogen gas 10 Nm3/hr. Purity of the Nitrogen gas generated at the outlet >99.00%. Although Nitrogen gas has versatile application in scientific work, but in HTTD, Nitrogen gas is used as pressuring gas to water in HPHT-WCS’ pressure vessel. Also Nitrogen gas is currently being used for venting of High heat flux Vacuum chamber.